Resolve block conflicts when editing a block post in the classic editor. Gutenberg’s strict content validation has helped identify formatting incompatibilities, and continued improvements are planned for future releases. Add word and block count to table of contents. Add support for meta attributes (custom fields) in block attributes. This allows block authors to specify attributes to live outside of `post_content` entirely. Allow Gutenberg to be the default editor for posts with blocks and add links to classic editor. Add crash recovery for blocks which error while saving. Hide Sidebar panels if the user doesn’t have the right capabilities. Refactor PostTaxonomies to use ‘withApiData’. Create ‘withApiData’ higher order component for managing API data. Allow toolbar wrapper to be clicked through. Support and bootstrap server-registered block attribute schemas. Shift focus into popover when opened. Reuse the tabbable utility to retrieve the tabbables elements in WritingFlow. Change placeholder text on button. Persist the sate of the sidebar across refresh. Use a small multiselect buffer zone, improving multiple block selection. Close popover by escape keypress. Improve search message to add context. Improve string extraction for localized strings. Fix issue where invalid block resolution options were not clickable. Fixed z-index issue of gallery image inline menu. Fixed image block resizing to set the figure wrapper. Fixed column widths in gallery block. Fixed parsing in do_blocks() and rendering of blocks on frontend in the_content. Fixed position of upload svg on mobile. I want to test gutenberg, can you please let me know the procedure of testing. @nicmalcm, thank you for offering to help test. If you want to test beyond self reporting we have a number of ways outlined here: https://make.wordpress.org/test/handbook/call-for-testing/gutenberg-testing/. What can we do to convince you that most of us do not want Gutenberg as a core component of WordPress? That we would much prefer it to remain a plugin. In fact, we don’t even mind it being a plugin that’s already installed. 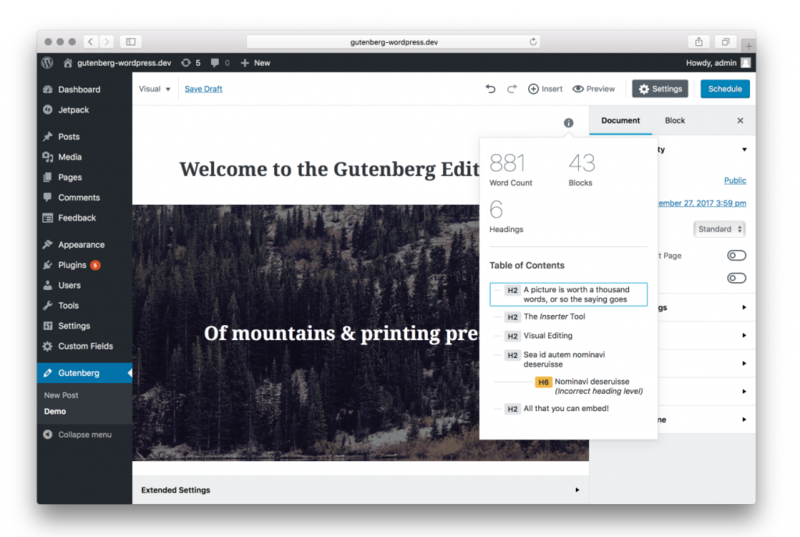 We just want to be able to use the content/page builders that we already use without Gutenberg messing them up. @reggieyancey, there will be an option to not have Gutenberg active, the how is not worked out yet. That said, I would suggest judging Gutenberg when it is finally complete and ready for merge proposal – it’s not yet. As you rightly hint at, Gutenberg needs to be tested to work with other content and page builders. It’s also worth saying that after Gutenberg comes the customization focus and page layout. I appreciate your response. While yes, I will wait to actually judge Gutenberg until after it comes out, my work process, time, and monetary investments have been in other page builders. I just want to make sure that Gutenberg is built with this in mind FIRST. I get that the other content builders will have to adjust somewhat…but Gutenberg should not, by default, break anything that is already on the marketplace. Which is why I’m a huge advocate for Gutenberg to be an included plugin and not a core component of WordPress. Or…the other possibility is to split WordPress into two branches. A version that has Gutenberg and a version that doesn’t. So that when you install WordPress you can choose which version to install. Perhaps change the version control to 5.0 for no Gutenberg and 5(g).0 for with it. Both are really good ideas, but I wouldn’t hold your breath. They have decided that Guttenberg is the way to go and are basically ignoring the community. Like you I have invested in software for my company and our clients which doesn’t seem to matter to the Guttenberg team. If you read the original timetable Guttenberg would have already been forced on us regardless of what we want or think. I am personally really disappointed in the attitude of the Guttenberg team, You will like this regardless of if you want it and if you don’t like it tough!